Known Acquaintances: Zenia Klob; Thug; Slasher; Ginger Biscuit. Known Enemies: Atticus Grammaticus Cattypuss Claw. Criminal Record: Chewing Atticus Claw’s ear and general villainy. The first thing you’ll notice when you see Atticus Claw is his chewed ear – and the culprit behind that is the world’s meanest tomcat, Ginger Biscuit! The two cats grew up together, but have ended up sworn enemies. 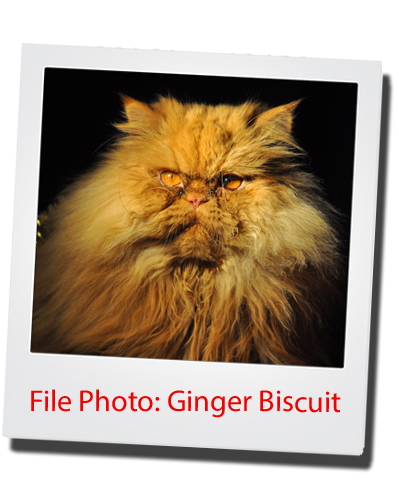 And have no doubt, Ginger is an enemy to fear! He eats rats, pike heads and, during the winter, even hunts bear! If rumours are to be believed, next time Ginger comes face to face with Atticus, he won’t just chew his ear – he’ll rip out his whiskers and use them to floss his teeth!